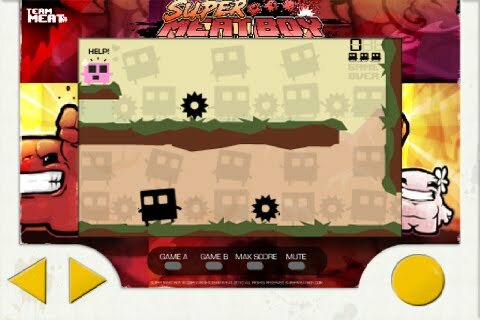 Edmund's dev blog for gay nerds: Super Meat Boy "Tiger" Handheld NOW ON IPHONE! Super Meat Boy "Tiger" Handheld NOW ON IPHONE! Remember way back in the day when you loved a game so much that you would buy ANYTHING that had to do with it? Remember Easter, when you had to go to your Great Aunts house to celebrate with the family, and you knew you would be bored in the car and the only thing you could bring was a crappy handheld version of some game you loved (for me it was Megaman 2) and you had no choice but to play it in the car and at her house because she was born in like the 1890's and didn't even have a VCR? Those were great days...and now, we at Team Meat, are giving you the ability to do that ALL OVER AGAIN ON YOUR IPHONE, IPOD AND EXPENSIVE GIANT IPOD (IPAD). Super Meat Boy Handheld is all the branding of Super Meat Boy, without the actual gameplay or art from Super Meat Boy...and all for ONLY A DOLLAR. Enjoy two distinct game modes. In Game A, you have to race and wall jump past saws to save your lady love Bandage Girl!!! In Game B, you have to race past falling needles to save your lady love, Bandage Girl!!! Super Meat Boy Handheld also features a mute button, and a button that when pressed shows you a high score(not your high score,just the highest score you can get). Super Meat Boy Handheld is available on the iTunes AppStore for only $0.99 (THAT'S NOT NINETY NINE DOLLARS YOU SILLY PEOPLE). Pick it up today, brag to your friends, and support Super Meat Boy!! PS: Those of you who dont get the joke click this link. "Express an opinion get an App pulled"
Iphone, you gotta love it! I have actually played it on my iphone... I didn't get "addicted" though, but I enjoyed it! I love all these iphone games, the battery used to wear down on my 3g but the iphone 4 is great for gaming!